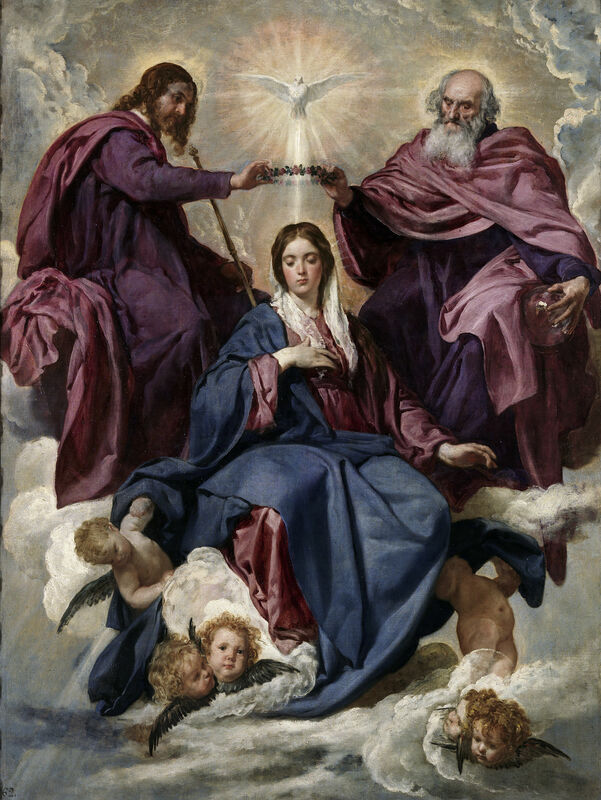 The Virgin Mary is the true Davidic Queen assumed into Heaven. This is so because Jesus Christ is the true Heavenly King who holds the key of David. There can be no doubt that Matthew’s Gospel envisions the restoration of the Old Testament Davidic Kingdom through the person of Jesus Christ, whom Matthew right away identifies as the “son of David” (see Matt 1:1). This is the very first verse of the New Testament, and the Jewish reader back then would have known automatically that the messiah was to be a descendant of the royal line of David. God had promised David an everlasting Kingdom (2 Sam. 7:12-17), and Jesus was clearly seen as the person who would “rebuild David’s fallen tent” (Acts 15:16). The overarching theme of Matthew’s Gospel is the Kingdom, or more precisely the Kingdom of Heaven, and Jesus inaugurates this Kingdom by establishing his church which brings the ancient Davidic monarchy to its true “perfection” (see references below). According to Dr. Hahn, “The structure of David’s monarchy was neither incidental or accidental; in God’s providential plan, it foreshadowed the Kingdom of God” (Hail, Holy Queen, p.76). “The Davidic monarchy finds its perfect fulfillment in the reign of Jesus Christ – and there was never a Davidic King without a Davidic Queen: the King’s own mother, the queen mother” (Id at 83, emphasis added). The queen mother was known as the gebirah or “great lady” (Id at 79). The “Gebirah was more than a title; it was an office with real authority” (id at 80). Thus, at 1 Kings 2:20 we read the reigning King say, “Make your request, my mother, for I will not refuse you.” Neither could Jesus refuse his mother’s request at Cana, even though the Lord’s time had not yet come to perform his first miracle (John 2:5). Mary, although ever-Virgin, is the mother of Jesus and the mother of the church. “Hear then, O house of David!…The Lord Himself will give you a sign. Behold, a virgin shall conceive and bear a son, and shall call his name Immanuel” (Is 7:13-14). “…the Immaculate Virgin, preserved free from all stain of original sin, when the course of her earthly life was finished, was taken up body and soul into heavenly glory, and exalted by the Lord as Queen over all things, so that she might be the more fully conformed to her Son, the Lord of lords and conqueror of sin and death….This motherhood of Mary in the order of grace continues uninterruptedly from the consent which she loyally gave at the Annunciation and which she sustained without wavering beneath the cross, until the eternal fulfillment of all the elect. Taken up to heaven she did not lay aside this saving office but by her manifold intercession continues to bring us the gifts of eternal salvation.” (From the Vatican II document, Lumen Gentium, quoted at CCC 966, 969). Image: The Coronation of the Virgin by Diego Velazquez, circa 1645 (according to Wikipedia The work of art depicted in this image and the reproduction thereof are in the public domain worldwide. The reproduction is part of a collection of reproductions compiled by The Yorck Project. The compilation copyright is held by Zenodot Verlagsgesellschaft mbH and licensed under the GNU Free Documentation License.). Any ads following this post are from WordPress and not this blog.